Distribution and habitat: Alocasia Amazonica is an artificially created hybrid between Alocasia longiloba X Alocasia sanderiana. This popular hybrid bred from Asian parents, Alocasia Amazonica is not a species, does not grow naturally in any native rain forest, is not from the Amazon and the name Amazonica is taken after the name of the nursery in Florida – USA where this hybrid was born. Popular as garden plants, they make decorative plants for verandas or patios and can grow quite successfully indoors as long as a humid atmosphere is maintained. 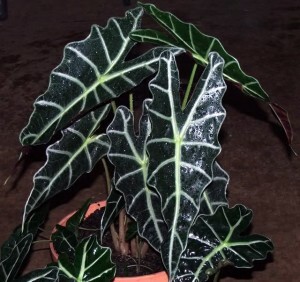 Description: Alocasia X amazonica has huge, arrow-shaped leaves up to 60cm (24 inch) long and about 30cm (12 inch) wide. The leaves are very dark green coloured with contrasting veins white and white scalloped margins. The greenish-yellow boat-shaped flowers appears in spring or summer, but are frequently insignificant, especially on plants cultivated indoors. These very handsome, lush looking plants make a dramatic appearance in indoor spaces. Houseplant care: This plant can be little tricky to grow because of high humidity and kind of constant temperature day and night requirements, but it is a rewarding plant for indoors gardeners who make the effort. Wipe down the dark leaves occasionally to keep them clean of dust and dirt and to keep them looking their best. Foliage may die back due to plant entering dormancy, but new leaves will sprout in a few months if rhizome is kept moist. Light: Alocasia X amazonica do best when they are sheltered from direct sunlight. Provide filtered light through a translucent curtain. Temperature: During the active growth period the ideal temperature range between 18 and 27°C (64-81°F). Winter temperature should not fall below 13°C (55°F). It is important to maintain a high level of humidity. Stand the pots on trays of moist pebbles in order to increase humidity around the plant. Water: Water generously during the active growth period making sure that the potting mixture is thoroughly moist. Allow the top centimetre (0.4 inch) or so to dry before watering again. During the cool rest period it is best to allow the top few centimetre (0.8 inch) to dry out before re-watering. Do not overwater the plant. Especially when the plant is young and small, too much water, particularly if the weather is cold, can rot the tuber. Fertilising: Apply a liquid fertiliser every two weeks during the active growth period. Cease the fertiliser applications as soon as plant growth starts to slow down – which generally happens in the early autumn. Potting and repotting: Potting is best done during the period of active growth, from early to late summer. Use a peat-based potting mix. Especially in cooler areas, it is important to use an open mix which dries out rapidly. It is best to choose a pot which is just big enough to accommodate the plant’s root system. Propagation: Propagate by taking baby tubers from root tips in spring or early summer. Place the tuber pieces in moist sand or verniculite. Cover with a plastic bag and leave in a warm spot in a shaded position. When root growth commences, pot up in regular potting mix and place in a warm, shady spot until growth is advances, then treat as a mature plant. Spider mites or scale can stress these plants. Treatment: Spider mite thrives in hot, dry air. Daily mist-praying may help ward off attacks. Cut away badly infested leaves and adjoining stems and spray plants with an appropriate pesticide. Repeat the treatment after 3 days and again 10 days later. If mites persists, tray a different pesticide. To eradicate the scales, mix a little mild dishwashing detergent with water and spray the infected plants. The soap will coat and suffocate the insects. Rinse the plants off with clean water to make sure the pores on the leaves are open so the plant can breathe. Avoid cold drafts, because if the plant is ever chilled or dries out, it will immediately drop its leaves and go dormant. Treatment: Correct the problem and the plant will grow out new leaves. Avoid too much moisture as it can cause crown rot, and low humidity causes leaf die back. Notes: Sometimes Alocasia X amazonica is confused with Alocasia micholitziana. Toxicity: All parts contain irritant calcium oxalate crystals (as typically found in members of the Araceae family) – which produce a stinging and swelling effect on mucous membranes and are toxic upon repeated ingestion. Keep away pets. The sap of these plants can be irritant for sensitive skin. 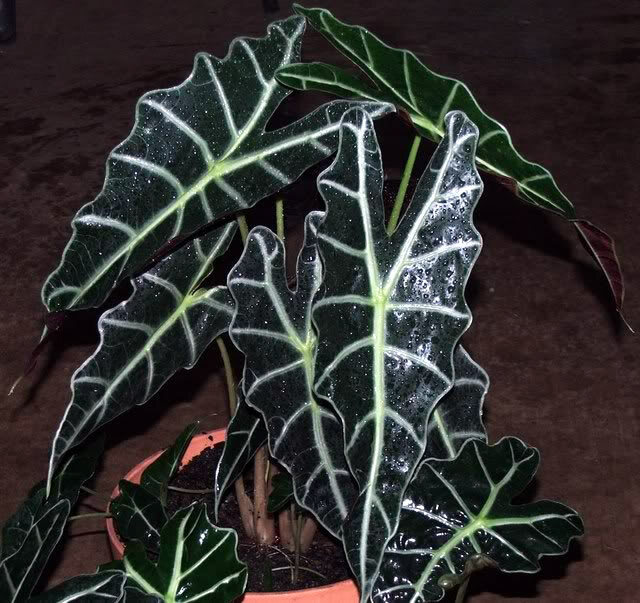 Uses: Alocasia X amazonica are suitable for container planting and are used as indoor plant and interior-scape.